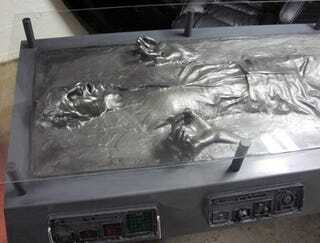 Click to viewWho wouldn't want a desk with Han Solo encased in carbonite? We checked in with Tom Spina Designs, the company that created this one-off custom-order desk, and found out that 1) it's incredibly solid—it's constructed out of steel—and 2) those lights on the side create mood lighting when admiring your human prize. Hit the jump for the details on how this thing was built and check out the exclusive pics in the gallery. The desk was designed and assembled by artists Tom Spina and Richard Riley of Tom Spina Designs, a NY-based company specializing in custom sculpture. It's made from four main components: the glass top, the frozen block and 2 light-up side supports. The side supports are computer-cut steel and feature tinted acrylic sheets and internal lighting. The frozen block is a custom fabricated steel "block" with fan-made resin detail pieces. Eight metal supports hold the 1/2" thick glass top. Due to the metal construction, it's not only very sturdy, but also quite heavy! This was designed and fabricated for the home theater/office of Mark Hall, lead singer of the Grammy Award-winning group Casting Crowns (www.CastingCrowns.com) and made to his specs on top height and leg clearance. We went through a lot of different ideas and designs for a sci-fi desk, but as soon as we hit on the carbonite style desk idea, we all knew this was what had to be made! The piece was created in roughly two months. On the availability question - this particular piece was intended as a one-off art-piece, but we do accept private commissions to custom-create highly unique furniture, characters and art for home theaters, businesses, trade shows and more. We also cater to high-end original movie prop collectors, doing extremely specialized restoration and display work. Folks interested in learning more (and more importantly, seeing pics of many of our past projects) should visit our site: www.TomSpinaDesigns.com and anyone looking for custom work should contact us via the site and we'd be happy to discuss their project.